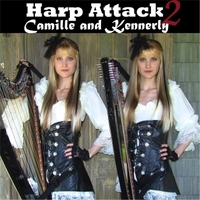 Camille & Kennerly Kitt, known collectively as the Harp Twins, are definitely two of a kind. 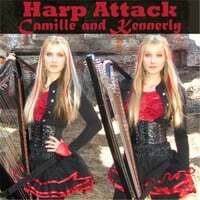 In fact they are currently the world’s the only known professional harp playing identical twins. With their immense popularity, personal charm and dedication to their many fans, they are also spearheading a small phenomenon, which they have dubbed the “Duet Harp Revolution”. But what it really comes down to is that these ladies are immensely talented musicians, with a repertoire that spans everything from covers of classic metal songs to movie and video game themes, and all arranged and performed in their own unique and masterful ways. This is the first of a three-part feature. How would you describe your work in general? We’re active in and in charge of every aspect of our career. We perform, arrange pieces, record covers, and create self-made music videos. We run our social media accounts, websites and make decisions about booking. It’s hard for us to describe our music. People usually just have to hear it to know it “works” in a fantastic way. We’re a Duet Harp Revolution! Any favorite projects that you’ve worked on? We put our hearts into every track and we worked with a friend to have the recordings professionally mastered. We even invited some international musician friends to join us on the last track. You are obviously a very close-knit and effective team, do you work together exclusively or are there also outside projects that you do individually? We’re a team – always. All of our projects have been together. Work and life are definitely more fun and fulfilling when we’re together!